When I pulled out the box of Valentine’s Day craft supplies, I was surprised to find a stack of red and pink paint chips. I’m sure I had some fabulous Valentine’s Day craft planned, but as hard as I tried, I could not recall what that was. We needed a Plan B for the paint chips. That Plan B became a Valentine’s Day Fine Motor Activity. Our kids love, love, love playing with my craft punches. Since I’m trying to teach them to share, I figure it’s only right that I share my toys too 🙂 Besides they are a great for building muscles in their little hands making them a great tool for fine motor activities. You don’t need a lot of supplies for this project making it quick to set up. We used two different sized heart shaped craft punches. 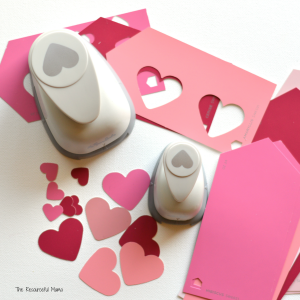 The hearts work great for Valentine’s Day, but any craft punches or even a hole punch would work for this activity. You also need paint chips, but cardstock or other stiff paper would work. We used reds and pinks, since that is what we had, but those colors keep with the Valentine’s Day theme of the project. While craft punches are fairly easy for you and me to use, they pose a challenge for little ones. Craft punches are a great way for them to strengthen the muscles in their hands that they will need to later for things like holding a pencil and writing. Our preschooler used two heart shaped craft punches for this project. With the bigger craft punch, she inserted the paint chip and used her whole hand to push down and punch the heart. With the smaller heart craft punch she used her thumb and index finder to punch out the heart. She probably could have benefited from an even smaller punch as she still had a little trouble with this size. We plan to use all of our punched out hearts to make Valentine’s Day cards.